Another quality eBook from Chapel Library. 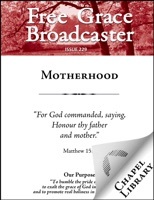 The theme of this Free Grace Broadcaster is Motherhood. Jabez Burns introduces us to the dignity of motherhood, something often lost to our culture. Thomas Boston briefly explores a mother’s main responsibility—a subject quite foreign to our post-Christian worldview. Peter Marshall develops something of a modern parable to show us our desperate need for a return to biblical motherhood. An almost forgotten Scottish Congregationalist named James Cameron gives us three articles—biblically training children, encouraging mothers, and calling mothers to Christ. John Angell James offers a further look at child training, while Puritan Richard Adams counsels mothers regarding loving, wise discipline. A highly edited version of Elizabeth Joscelin’s letter highlights numerous practical and spiritual themes for mothers. And Charles Spurgeon gets the last word, making a beautiful parallel between motherhood and a church’s responsibility to bring up its children.